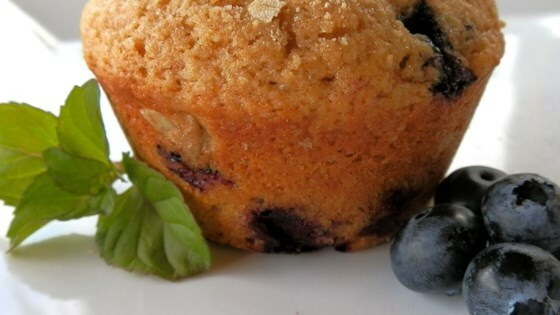 "These yummy muffins are made with all whole wheat flour and lots of fresh blueberries. My husband says they're the best muffins he's ever tasted, and even my super picky kids love them!" Preheat oven to 400 degrees F (200 degrees C). Grease 12 muffin cups, or line with paper liners. Whisk together the flour, sugar, salt, and baking powder in a large bowl. Enjoy these tasty muffins for a healthy, hearty breakfast treat. We've also made these vegan with great success by using almond milk in place of regular, and 1 tablespoon egg replacer and 1/4 cup water in place of the egg. The muffins were good but nothing too special. I made another batch from a cookbook that included cinnamon and stirred in the sugar at the very end with the blueberries that were incredible. These muffins turned out great! I made only one change - I used a 6 ounce container of fat free vanilla yogurt instead of the oil. They are delicious, moist, and full of blueberries. Great recipe! So easy and with great results. I made these while camping and I didn't have applesauce with me so I shredded an apple to use instead. It worked/tasted wonderful. Made as is, except for adding a t. of vanilla. I used frozen wild blueberries - excellent recipe. Moist, flavorful, and simple!